With Visa’s new vein recognition payment concept you can literally wave your money goodbye. The company demonstrated their vision of future payment methods at the 2016 Mobile World Congress in Barcelona. Every single day of every week, an estimated 150,000 new Chinese shoppers join the ranks of the hundreds of millions in the country who have discovered the world of e-commerce. 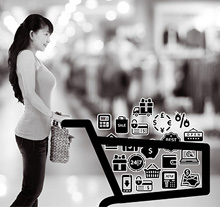 Online retail penetration in China reached 11% in 2014 and surpassed RMB 2.9 trillion in total value. Penetration is expected to double by 2020, according to our estimates, with the total value skyrocketing to RMB 10 trillion. But this dramatic adoption of online shopping is not the biggest news to emerge from Bain & Company’s latest research on China’s e-commerce market. A banking revolution in terms of financial services will benefit from the UK’s Open Banking Standard. Story by Daoud Fakhri. The Open Banking Working Group’s newly published recommendations on open platform banking will, if fully implemented, lead to a revolution in the provision of banking services to UK consumers. KPMG surveyed 1,500 bank clients about their awareness of and interest in digital wealth management, or robo-advisors. Could The 2009 Crisis Have Been Avoided With Blockchain? This post will explore the 2009 subprime mortgage crisis and the hypothetical impact a blockchain may have had with regards to the proliferation of toxic synthetic Mortgage Backed Securities (MBS) and Collateralized Debt Obligations (CDOs).